Service Spotlight: V2 Composites, Inc.
— Caleb Barrow, V2 Composites, Inc.
V2 Composites is a manufacturing company based in Auburn, AL that designs and fabricates some of the industry's strongest and most versatile composite reinforcement solutions used in bridges, high-rise buildings, and aircraft among other applications. V2 contacted CarePoint Resources when they saw the need for on-site first aid and CPR training for their employees. "In a facility like ours with a lot of moving components, forklift traffic, and chemicals there is nearly endless potential for an onsite accident. We have a former EMT on 1st shift and an Army Medic on 2nd, but most of our other employees did not feel knowledgeable about what to do should an emergency occur," explains Caleb Barrow with V2. CarePoint worked with V2 to find a convenient date and time for their training. The helpful instructors arrived early to set up for the 4-hour American Safety and Health Institute CPR AED and Basic First Aid class. 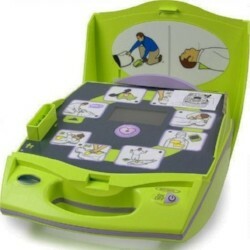 During class setup, it was mentioned that V2 was interested in purchasing an AED for their workplace. "Our plant is in a fairly secluded location, so it would take an ambulance a while to get to us. In an emergency, especially a heart attack, when every second counts, it's critical that our entire staff be trained in administering CPR and using the AED," says Barrow. CarePoint is proud to faithfully serve clients who value the safety of their employees and patrons. We measure our success by the confidence of those we equip. Speaking on CarePoint's services, Barrow concludes, "My coworkers and I feel much better about our chances of survival should the worst happen now that we have the AED on site, and the knowledge to properly use it. I would recommend CarePoint's services to anyone seeking to improve their medical emergency preparedness." BLS vs. CPR What is BLS?